FIREFLY toothbrushes are next on our list for the Holiday Gift Guide as they make for great stocking stuffers and extras, which are both necessary and, in this case, fun! No more boring old toothbrushes! FIREFLY has different character designs and the ones we have are Star Wars and a Hello Kitty brushes to suit everyones personality and taste. The Star Wars toothbrushes (for ages 8 and up) make lightsaber noises for 2 minutes and flash either blue (for the light side) or red (for the dark!) and turn off when time is up to let the children know when to stop brushing! The Hello Kitty brush has a "traffic light" style light system that flashes green to start, amber when time is almost over and then red, to stop and finish, 2 minutes later. There are so many different kids of brushes and I we are very excited about the Peanuts character toothbrushes and in general, no more boring toothbrushes, at all! Heck, these are even the funnest toothbrushes in an electrical outage - light's out, light's on and GO! Sparkly clean teeth. It is recommended to brush your teeth after eating sweet treats (and twice a day) so you can never have too many toothbrushes, which my household knows well. We always have spare toothbrushes on hand to make sure little fingers haven't lost, broken or attempted to chew up their brush when learning, and the character brushes from FIREFLY actually make them rush to get in the bathroom and brush for those 2 minutes or more! I like that they come in a range of characters, with lights, without lights, with matching mouth washes (on some characters) and everything from manual to electric brushes for all kids with a sense of fun and adventure. 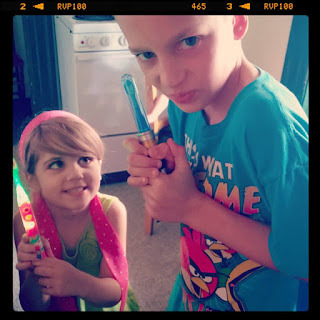 My kids love to play with the lightsaber brushes and also like a little mini disco in the bathroom with the lights out - their routines have been made that little bit more fun, even though I have always pushed for good oral hygiene as you just can never prevent too much! Head on over to the FIREFLY website, today and see which brush is right for you, then pop them in those Christmas stockings for a practical, fun gift that keeps on giving with the return on clean teeth! You can also find FIREFLY on Twitter and Facebook, respectively and follow Mom's Gone Bronson's Holiday Gift Guide on Twitter with hashtag #MGBHGG and via the tab at the top of this blog! Have fun, shopping for the holidays, and happy gifting! Disclaimer: I was given some Firefly toothbrushes to review and to give my honest opinions. I was not otherwise compensated for this post. Your views may differ, thank you! Oh those look so fun! Little Carter would love the Peanuts toothbrush! I love the StarWars that lights up and goes for 2 minutes! A great way for the kids to know how long to brush for!